Edgar Bonfman: How some apples, walnuts and good port wine brought back grandmother's recipe and made me love the holiday. (JTA) When I walked into the house through the back door one day as a young man, I was shocked to see my mother in the kitchen. To put it mildly, this was not one of her favorite places. When I asked her why she was there, a look of panic crossed her face. Sensing her culinary discomfort, I volunteered to take over. With a look of vast relief, she fled the scene. 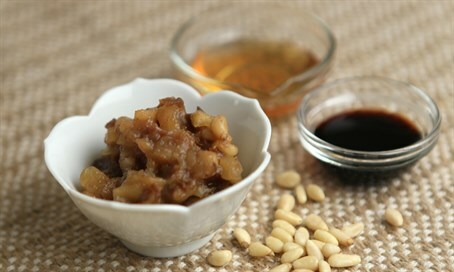 Guided by the memory of my grandmother’s charoset — the sweet, chunky, fruity mixture that symbolizes the mortar used by the Hebrew slaves to build Egypt’s real estate — I chopped up apples and walnuts and added raisins. I mixed them together, then added a couple of spoonfuls of honey and a generous splash of port wine. During the seder, my charoset received wild compliments all around. I don’t think it’s a stretch to suggest that my hands‑on involvement, combined with the warm, welcoming embrace of my efforts, contributes to my love of Passover, the holiday most deeply embedded in the Jewish consciousness. Though its earliest origins may be as a spring festival, and to be sure, many elements of the spring agricultural celebration remain, those elements gradually evolved into the eight-​­day holiday we celebrate today during the month of April. The theme of a journey from subjugation to freedom is at the heart of the Passover story, and there is a strong emphasis on repeating the liberation story every year and to each generation. This stern direction to remember our own story of liberation and keep it alive across generations lifts it into universal resonance. The Exodus from Egypt is not to be seen as a one-​­time historical occurrence with a beginning and an end: oppression, struggle, victory. It is not only those slaves, but all slaves, that concern us; not only that struggle, but all struggles. Each generation must learn anew how to overcome the wrongs of the world; the job will never be done. Children will not be born into a perfect world created for them by their parents. They can only continue to hold the torch, and their parents’ role is to teach them how to carry on the fight for justice. That is why the Passover ritual is central to Judaism. It is so crucial that whoever does not keep it, the Bible tells us, will be cast out and will no longer be considered a part of Israel. In other words, this is the premise of Judaism: If you are to be a part of the people, you must struggle to maintain or realize freedom all your life.